After a month of kickflips, campaigning and generally going buck-wild on all manner of stairs, rails and boxes, Session has successfully blown away its Kickstarter goals, raising a total of $163,716 CAD (204.6% of its initial $80,000 goal). Not only does this allow the team at crea-ture Studios to make Session bigger and better than ever as they ride into 2018, but it means they also reached their much-sought-after vert skating stretch goal! Bringing in modern skating icon and five-time X Games medalist, Elliot Sloan, crea-ture Studios is set to give players even more ways to skate in the new year. Not only will the vert update offer up mini-ramps, mega-ramps and motion capture courtesy of Elliot himself, but the team’s been hard at work perfecting reverts for buttery-smooth line transitions. More ways to skate, more ways for players to express themselves in the park. Speaking of parks, to celebrate the end of Session’s crowdfunding campaign, crea-ture Studios has made a new and improved skatepark available to backers: Indoor Park v2. 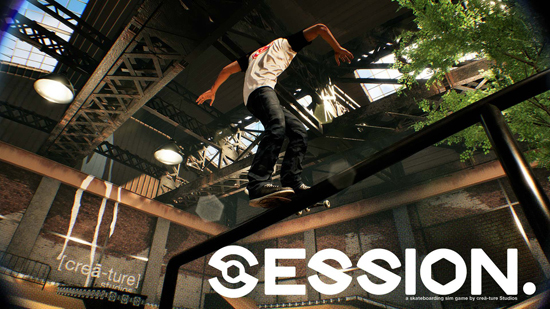 Originally shown off in early gameplay footage as an indoor alternative to the demo’s jail yard setting, the team has since rebuilt this park from the ground up and relocated it to a giant hanger, making for a skater’s paradise. From its raised rails, to its kinked boxes, Indoor Park v2 offers up a ton of space for players to get creative and set up all-new lines. That’s not all skateboard fans have to look forward to in the early months of 2018, though, as the team at crea-ture Studios has a whole host of surprises and skateable content planned. Setting itself apart as the most authentic skateboarding game ever, crowdfunding was only the beginning for Session. From its first pro skater, to new parks and ways to skate, grab your deck and tighten those trucks, because Session is happening! Session’s Kickstarter is now complete, with the game planned to launch into Early Access on PC and Xbox One early 2018.